Bayezid I by Cristofano dell'Altissimo. 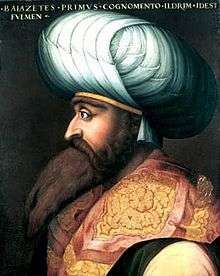 Bayezid I (Ottoman Turkish: بايزيد اول‎; Turkish: 1. Beyazıt; nicknamed Yıldırım (Ottoman Turkish: یلدیرم), "The Thunderbolt"; 1360 – 8 March 1403) was the Ottoman Sultan from 1389 to 1402. He was the son of Murad I and Gülçiçek Hatun. He built one of the largest armies in the known world at the time and unsuccessfully besieged Constantinople. He was defeated and captured by Timur at the Battle of Ankara in 1402 and died in captivity in March 1403. The first major role of Bayezid was as governor of Kütahya, a city that was conquered from the Germiyanids. He was an impetuous soldier, earning the nickname of Lightning in a battle against the Karamanids. Bayezid ascended to the throne following the death of his father Murad I, who was killed by Serbian knight Miloš Obilić during (15 June), or immediately after (16 June), the Battle of Kosovo in 1389, by which Serbia became a vassal of the Ottoman Sultanate. Immediately after obtaining the throne, he had his younger brother strangled to avoid a plot. In 1390, Bayezid took as a wife Princess Olivera Despina, the daughter of Prince Lazar of Serbia, who also lost his life in Kosovo. Bayezid recognized Stefan Lazarević, the son of Lazar, as the new Serbian leader (later despot), with considerable autonomy. A manuscript of the Quran from the reign of Bayezid I. The upper Serbia resisted the Ottomans until general Pashayigit captured the city of Skopje in 1391, converting the city to an important base of operations. Meanwhile, the sultan began unifying Anatolia under his rule. Forcible expansion into Muslim territories could endanger the Ottoman relationship with the gazis, who were an important source of warriors for this ruling house on the European frontier. So Bayezid began the practice to first secure fatwas, or legal rulings from Islamic scholars, justifying their wars against these Muslim states. However he suspected the loyalty of his Muslim Turkoman followers, for Bayezid relied heavily on his Serbian and Byzantine vassal troops to perform these conquests. In a single campaign over the summer and fall of 1390, Bayezid conquered the beyliks of Aydin, Saruhan and Menteşe. His major rival Sulayman, the emir of Karaman, responded by allying himself with the ruler of Sivas, Kadi Burhan al-Din and the remaining Turkish beyliks. Nevertheless, Bayezid pushed on and in the fall and winter of 1390 overwhelmed the remaining beyliks -- Hamid, Teke, and Germiyan—as well as taking the cities of Akşehir and Niğde, as well as their capital Konya from the Karaman. At this point, Bayezid accepted peace proposals from Karaman (1391), concerned that further advances would antagonize his Turkoman followers and lead them to ally with Kadi Burhan al-Din. Once peace had been made with Karaman, Bayezid moved north against Kastamonu which had given refuge to many fleeing from his forces, and conquered both that city as well as Sinop. From 1389 to 1395 he conquered Bulgaria and northern Greece. In 1394 Bayezid crossed the River Danube to attack Wallachia, ruled at that time by Mircea the Elder. The Ottomans were superior in number, but on 10 October 1394 (or 17 May 1395), in the Battle of Rovine, on forested and swampy terrain, the Wallachians won the fierce battle and prevented Bayezid's army from advancing beyond the Danube. In 1394, Bayezid laid siege to Constantinople, the capital of the Byzantine Empire. Anadoluhisarı fortress was built between 1393 and 1394 as part of preparations for the Second Ottoman Siege of Constantinople, which took place in 1395. On the urgings of the Byzantine emperor Manuel II Palaeologus a new crusade was organized to defeat him. This proved unsuccessful: in 1396 the Christian allies, under the leadership of the King of Hungary and future Holy Roman Emperor (in 1433) Sigismund, were defeated in the Battle of Nicopolis. Bayezid built the magnificent Ulu Cami in Bursa, to celebrate this victory. Bayezid I held captive by Timur, painting by Stanisław Chlebowski. Thus the siege of Constantinople continued, lasting until 1402. The beleaguered Byzantines had their reprieve when Bayezid fought the Timurid Empire in the East. At this time, the empire of Bayezid included Thrace (except Constantinople), Macedonia, Bulgaria, and parts of Serbia in Europe. In Asia, his domains extended to the Taurus Mountains. His army was considered one of the best in the Islamic world. In 1397, Bayezid defeated the emir of Karaman in Akçay, killing him and annexing his territory.In 1398, the sultan conquered the Djanik emirate and the territory of Burhan al-Din, violating the accord with Timur.Finally, Bayezid occuped Elbistan and Malatya. In 1400, the Central Asian warlord Timur succeeded in rousing the local Turkic beyliks who had been vassals of the Ottomans to join him in his attack on Bayezid, who was also considered one of the most powerful rulers in the Muslim world during that period. 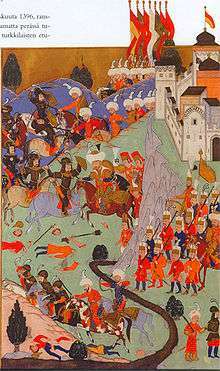 In the fateful Battle of Ankara, on 20 July 1402, Bayezid was captured by Timur and the Ottoman army was defeated. Many writers claim that Bayezid was mistreated by the Timurids. However, writers and historians from Timur's own court reported that Bayezid was treated well, and that Timur even mourned his death. One of Bayezid's sons, Mustafa Çelebi, was captured with him and held captive in Samarkand until 1405. Four of Bayezid's sons, specifically Süleyman Çelebi, İsa Çelebi, Mehmed Çelebi, and Musa Çelebi, however, escaped from the battlefield and later started a civil war for the Ottoman throne known as the Ottoman Interregnum. After Mehmed's victory, his coronation as Mehmed I, and the death of all four but Mehmed, Bayezid's other son Mustafa Çelebi emerged from hiding and began two failed rebellions against his brother Mehmed and, after Mehmed's death, his nephew Murat II. A commando battalion in the Pakistan Army is named Yaldaram Battalion after him. Yildirim Beyazit University, a state university in Turkey, is also named after him. His mother was Gülçiçek Hatun who was of ethnic Greek descent. The Battle of Nicopolis, as depicted by Turkish miniaturist in 1588. The defeat of Bayezid became a popular subject for later Western writers, composers, and painters. They embellished the legend that he was taken by Timur to Samarkand with a cast of characters to create an oriental fantasy that has maintained its appeal. Christopher Marlowe's play Tamburlaine the Great was first performed in London in 1587, three years after the formal opening of English-Ottoman trade relations when William Harborne sailed for Constantinople as an agent of the Levant Company. In 1648, the play Le Gran Tamerlan et Bejezet by Jean Magnon appeared in London, and in 1725, Handel's Tamerlano was first performed and published in London; Vivaldi's version of the story, Bajazet, was written in 1735. Magnon had given Bayezid an intriguing wife and daughter; the Handel and Vivaldi renditions included, as well as Tamerlane and Bayezid and his daughter, a prince of Byzantium and a princess of Trebizond (Trabzon) in a passionate love story. A cycle of paintings in Schloss Eggenberg, near Graz in Austria, translated the theme to a different medium; this was completed in the 1670s shortly before the Ottoman army attacked the Habsburgs in central Europe. Bayezid (spelled Bayazid) is a central character in the Robert E. Howard story Lord of Samarcand. Wikimedia Commons has media related to Bayezid I.